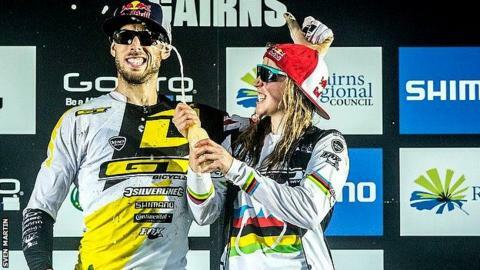 British siblings Gee and Rachel Atherton won the men's and women's elite races in round two of the Mountain Bike World Cup in Australia. After heavy rain in Cairns, Rachel won by 11 seconds from compatriot Manon Carpenter and Myriam Nicole of France. Gee finished four seconds clear of fellow Briton Josh Bryceland and American Neko Mullaly. He said: "That was amazing, totally wild, I'm so stoked with the double win. Rach rode it like a boss." Rachel added: "That was the hardest race ever. The conditions made the racetrack horrifically muddy, slippery and slow to roll, it was so hard. "I was absolutely blown away by Gee's performance, he never fails to surprise and impress me. Proud of my bro!"